The habit of feeling compelled to endlessly repeat a self-defeating practice for no good reason. According to ancient Greek mythology, Sisyphus was a man who undertook activities that were deemed inappropriate. He was punished by being forced to roll a huge boulder up the side of a steep mountainside in the attempt to get it to the top. Every time he came close to the top the boulder would roll back to the bottom, forcing poor Sisyphus to have to start all over again. While numerous people have speculated that he eventually found success and was relieved of his excruciating task, there is no conclusion to the Greek myth. I am sure most of us can relate to Sisyphus in one or more aspects of our life. For me, this is most true when it comes to thinking. I am a habitual thinker, at one point in my life it was driving me nuts, but I’m a creative guy, so I learned to positively channel my incessant thought-stream into the arts. I spend a lot of time making art and design, writing, and thinking about the human condition, existence, self-awareness, and many other such thoughts which constantly run through my mind. This isn’t the first blog I’ve started, it’s one of many (that I’ve lost interest in) as well as many other platforms like personal websites, Facebook pages, Twitter, Soundcloud, etc. Created and deleted, et cetera, et cetera. My biggest, personal Sisyphustic problem lies with the things that interest me: which is almost everything. So in the past, when I started a blog or a page, I would try (as advised) to keep it to one subject, the problem though is that I get bored with it. Part of a short-attention-span culture I guess. From what I can gather, art originated out of the need to share, as a way to tackle the very thoughts that plague us, the same thoughts that have plagued humans since the dawn of our kind. In many ways, this blog is about my inner as well as my outer journey: One Artist’s Neverending Quest to Find Himself. So I’ve decided, against all good advice, that on this blog I shall not limit myself to a topic per se, but the theme could be considered Finding my place in the World. In many ways, this blog is for me, for my growth, and the active pursuit of this journey. But it is also for anybody who feels a little lost, especially those inclined to think of themselves as artists, or creatives… so let us take this journey together, let’s get Lost in Thought. For me, this comic illuminates the idea that it’s all a matter of perception. 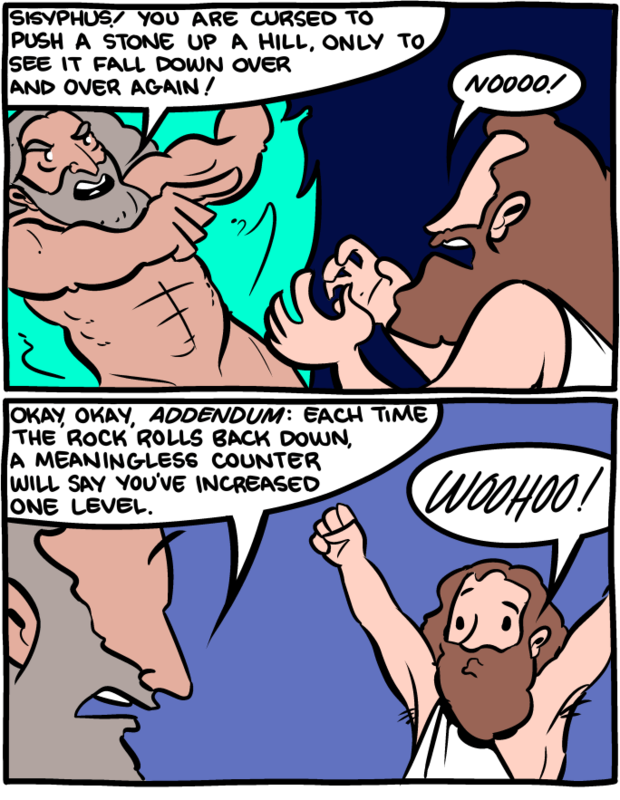 “Meaninglessly increasing your levels” is something that we all do. What is meaning anyway? Is it not something we create ourselves? The root of my Sisyphus Syndrome is one of self-discovery: the search for answers. Thing is, with something as personal as self-discovery, answers always tend to lead to more questions. So I’ll just accept that the questions are my “point-counter” and my answers are the rock rolling down the hill. So yeah… I’m going to push it back up again, I mean, really, what else am I going to do with my time? Previous Previous post: The “meaning” of life.